This post has been revised yearly (through 2017) to reflect updates to the game. 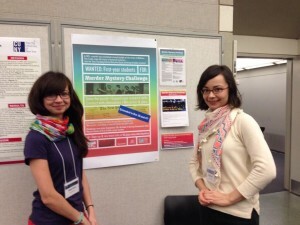 In January 2014, I presented a poster with my colleague Marta Bladek at the CUNY Games Festival, held at the Graduate Center. We also presented this project on June 4, 2015 at City College of New York for the annual CCNY Libraries' Professional Development Day. 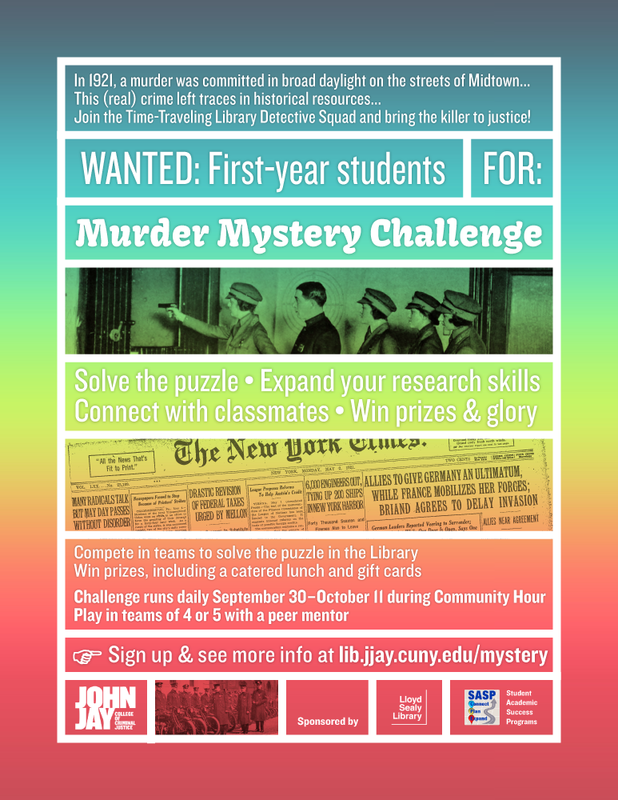 In fall of 2013 and 2014, the Lloyd Sealy Library first partnered with Student Academic Success Programs (SASP) at John Jay College of Criminal Justice to create and coordinate a Murder Mystery Challenge, designed to walk first-year students through basic research tasks. The game has been repeated yearly for first-years and transfer students. The Challenge followed a murder case narrative based on a real 1921 crime. Students used historical resources and were exposed to some of our digitized Special Collections materials. Students signed up in teams for an hour-long time slot in the Library during the designated two-week period. Teams competed to complete tasks like searching in online newspaper archives, finding a book in the stacks, and citing a scholarly source properly. Facilitating active team learning by coordinating with the existing Peer Mentor social structure contributed to the game’s popularity. Teams were guided by enthusiastic Peer Mentors (sophomores) who were assigned by SASP and trained by librarians. The teams were therefore self-sufficient and did not require librarian supervision. Originally in 2013, the Challenge took place in the library but was almost fully online using a Google Drive multi-page form. We chose to use a web form at the time because it required fairly little overhead and provided to-the-second stats. Moreover, college-level research takes place primarily online, and the library supports building strong digital literacy skills. But in Fall 2014, we changed gameplay to be almost entirely paper-based (with online research tasks), due to student feedback strongly advocating for a group activity that did not involve the team looking over one person's shoulder at the computer screen. The goal is to be as accurate as possible; each clue is scored according to a points rubric. (Originally, in 2013, the three teams to finish accurately and most quickly won, but speed shouldn't have been a factor.) Winning teams received prizes provided by SASP, including lunch in the Faculty Dining Room, New York Times tote bags, and $20 Amazon gift cards. Marta & me presenting the poster about the game in January 2014. Photo by Maura Smale (thanks!). In 2013, over 75 first-years participated in teams of 4-5, over twice the number expected. In 2014, we decreased the size of teams to 2-3 for a better learning experience, and 45 first-year students participated. In feedback for both years, 100% of surveyed students noted that they learned at least one of the basic research skills listed in our goals. The majority of students rated the game as being "fun" to "very fun," and most found the clues to be fairly easy (with Peer Mentor instruction and hints included in the clues). In fact, many students wished the Challenge were more difficult and longer (!). A fuller write-up: The Murder Mystery Challenge: a pilot project with an impressive turnout (2013). The next year, we updated the Challenge using student feedback to make a better game. Try it at your library! You'll have to change the resources below to reflect what your students can access through your library, and you will have to rewrite the instructions and hints to pertain to your library's webpage. All are welcome to tweak, revise, and change up as much of the Challenge as desired. It is offered under a CC BY-NC-SA license (attribute the game to me; don't sell it; if you revise the game and share it, use the same license). If you use it at your institution, please let me know — I'm very interested to see how the game can change and work for other student populations, and I'd be glad to hear what does and doesn't work. Mostly paper-based; includes a scavenger hunt that leads students to different parts of the library via rhyming couplets. Email me for these materials. Run the Murder Mystery Challenge in your own library! This version is especially suited for other CUNY libraries. It is offered under a CC BY-NC-SA license.